Midsummer used to be a day of feasts and bonfires. A day when cares were set aside for the joy of grass between our toes, warm hands in our palms, laughter in our hearts. Our celebrations dimmed with the light. Something upset the balance of our woods. Something so deep that even our bonfires can't lure the sun back. And he has something to do with it. Of that we're sure, which is why I'm being given to him. K. M. Rice is a national award-winning screenwriter and author who has worked for both Magic Leap and Weta Workshop. 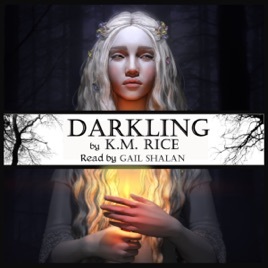 Her first novel, Darkling, is a young adult dark fantasy that now has a companion novel titled The Watcher. Her upcoming Afterworld series is set to debut with the first book, Ophelia. Over the years, her love of storytelling has led to producing and geeking out in various webshows and short films. When not writing or filming, she can be found hiking in the woods, baking, running and enjoying the company of the many animals on her family ranch in the Santa Cruz Mountains of California.